For some at Easter time, only an artisan, hand-made bun will sate our cross-shaped cravings. With the rain pelting down outside for the first time in a very long time and a cold wind blowing in from the west we turned the oven to 160C and started warming up the hot cross buns. The day before we had trammed and trained around Melbourne picking up buns from half a dozen bakers who had caught our attention. Our objective was to assemble a collection of buns from esteemed bakers to present a range of different styles at the top end of the bun market. Within minutes the kitchen was filled with the sweet aroma of Easter; cinnamon, cardamom, nutmeg and cloves. 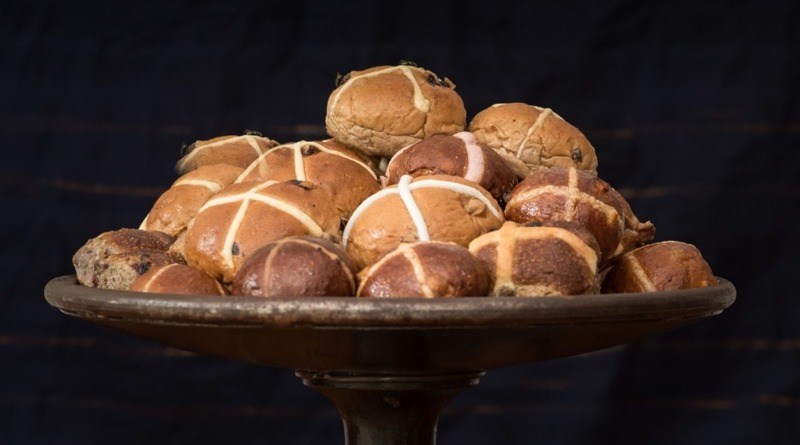 With a block of fresh butter on one side of the table and a pot of hot tea on the other we sat down to taste half a dozen of Melbourne's finest hot cross buns. If you like the aesthetic of Game of Thrones you're going to love this wonderfully earthy and unadorned raisin and pecan nut hot cross bun from Baker Bleu in Elsternwick. There is no piped-on cross. Instead, the mark has been made by stroke of a steel blade cutting through the skin of the proved but unbaked buns. Made by Mike and Mia Russell, bakers to star chefs such as Ben Shewry and Andrew McConnell, this very basic bun is made from heritage wheat flour, sourdough levain, flame raisins from Mildura and pecan nuts from Byron Bay. The dough is fermented in total for 48 hours. There is no spice, just the complex aromas and flavours that result from a very long, slow and thorough fermentation. If food were music then this bun would be all about the bass – big fat round notes of wild yeast, humble nutty aromas of cooked wheat flour and a faint savoury note. This is the bun for those who like them a bit rough, rustic and spicy. What you first notice is the offset cross, more Danish flag than overt crucifix. Open the bun and small steamy clouds carrying the aromas of cardamom, cloves and real cinnamon waft from the interior. Baker John Farnan, founder of this, Victoria's first certified organic baker, carefully roasts and grinds his own spice mix for each batch of buns and uses a sourdough levain that has been growing for 38 years. He uses only organic flour, spices, biodynamic dried fruits and organic peel. The bakery is based in Torquay but distributes throughout Melbourne and Victoria. The robust nature of these buns means they last and are perfect for toasting. While ticking all the boxes for the use of ethical and sustainable raw materials, this hot cross bun is incredibly refined in texture and restrained in flavour. Despite the fact that it is made with more robust red wheat flour from Tuerong Farm on the Mornington Peninsula, along with rye and spelt, it has a distinct lightness of the crumb. The beautifully formed buns reflect baker Boris Portnoy's experience in Michelin-starred restaurants in Europe and California. The delicate nature of the spices – namely Sri Lankan cinnamon and Java pepper – make this bun perfect for warming and serving with your best butter and a pot of your finest tea. Purists would argue that being made with a dark spicy brioche dough and filled with 51 per cent Acao dark chocolate would render these truly delicious little buns pretenders to the HCB crown. But when heated the medallion-sized button of chocolate inside melts into a delicious, gooey mouthful surrounded by buttery dough dotted with morsels of candied orange peel and plump sultanas making a plush post lent treat. They are made daily in the kitchens of the stately Windsor Hotel on Spring Street by French pastry chef Jeremie Parmentier and must be ordered online in advance for pick-up at The Windsor. Parisian baker Gontran Cherrier has a global empire of eponymous branded bakeries including three in Melbourne. (The owner of the brand in Victoria is the Melbourne Racing Club). The Melbourne team developed a mulled wine bun this year with Cherrier's blessing. It looks like a normal bun but with a pink hue from the red wine. There is a hit of spices you'd find in mulled wine without the alcohol. Under that are the flavours of a really well made yeast bun – in this case made with French flour and French butter. With a really good texture this is an attractive bun that tastes too traditional to be a novelty. 140 Smith Street, Collingwood; 89 Swan Street, Richmond; 696 Glenferrie Road, Hawthorn; $4.50 each. Baker Phillippa Grogan is a traditionalist and insists that hot cross buns must be a yeasted bun containing spices, fruit and peel. She developed her recipe 25 years ago when she first opened her Armadale bakery and based it on the buns of her childhood. This is perhaps the best all-rounder: it has a chewy crust and spicy interior with six different spices that are freshly ground each week by a spice supplier. (Grogan refuses to tell us the spice mix but we can detect nutmeg, cinnamon and allspice.) She makes the candied orange peel from orange rind from farmer's market juice stands and buys vine fruit from organic Victoria growers. Glazed with sugar and water they warm up perfectly and make the ideal bed for slabs of cold butter. Richard Cornish is the co-author of Phillippa's Home Baking (Penguin Lantern).